Everybody wants to speak. Everybody wants to show off their knowledge. Yes, it requires courage to do so. But people think that silence is weakness. Wrong! It is not a weakness. When a person is silent, it does not mean he is in the dormant state. He might be in the most active state of his mind. When a person is not speaking up his thoughts, he might be processing more and more from it. Perhaps, he or she will come up with the greatest idea the world has ever seen. It also takes as much as courage to listen to others. 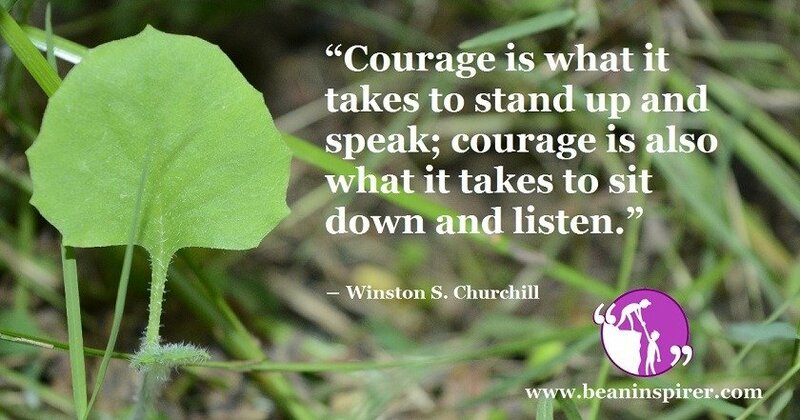 To prove this, Winston Churchill has rightly said, “Courage is what it takes to stand up and speak; courage is also what it takes to sit down and listen.” Winston Churchill was a good orator and he knew how much courage did it take to sit down and listen to someone lecturing or talking. If you cannot speak but if you can listen carefully, you are courageous. Do not get disheartened that you cannot speak well of others. But, you can try to improve your oratory skills to tell the world what your mind has been thinking until now. The God has given us the splendid power to think. Only if we remain silent for a moment, only then we can think about something productive. Now, a good orator can speak well only if he has thought about that topic before. That is why listening improves oratory skills as well. You just do not sit and listen. On the same time, you can read minds of the orators. Study their hand gestures and you can find their weakness as well. This is the reason why great scholars have been advising to sit properly and listen to the discussion since ages. Some people who think that silence is not the strength of that person, then let me tell you, they are damn wrong this time. Silence requires courage. It requires to sit and listen to someone’s views. That other person might be talking anything but all you have to do is to sit and listen to his views. His views might be good but it might be bad as well. That is why a lot of courage is required to remain silent and to listen. If someone calls you weak when you just listen, ignore them. Focus on the words of the speaker. See if he is making any sense. See what you can get from him. When a speaker speaks, he bombards his knowledge on you. Grasp what can be useful for you. When you are silent, you grasp more. How? When you are speaking, you are speaking those things that you already knew. When you are listening, then you might be grasping something new. You might be listening to the wise words of wise people of the world. These words can be useful to you in the future. These words might be a motivational piece to you. Or these words can be a source of great information for you. Only if you listen to such people, you will get what is new for you. So, never let anyone tell you that sitting and listening is somebody’s weakness. If you have decided to sit and listen to wise people, then you should know some ways in which your listening can be effective. 1. Pay Attention: Just pay attention. Do not think of anything else. Look at the gestures of the orator. 2. Maintain Eye Contact: When you maintain eye contact, you feel connected. You would be able to grasp more. So, you should try to have some occasional eye contact with the listener. 3. Giving Feedback: Nod along if you agree. Do not interrupt if you do not agree. Nodding keeps you active. Even if you show that you are listening, your listening skills are improved further. So, this sitting and listening require courage. It needs constant practice to sit and listen to other’s thought. It is tougher to retain the new knowledge you gained during listening and it is toughest to act upon those weaknesses of yours.